Christopher and Mikhal chose the powdery sanded vista of Clearwater Beach as the venue for their wedding ceremony on a cloudy Saturday afternoon, the sixteenth of February. To a soundtrack of carefully curated musical selections, Mikhal was escorted down the aisle by her uncle to join Christopher in front of their bamboo wedding arch in front of an intimate group of their family and friends. 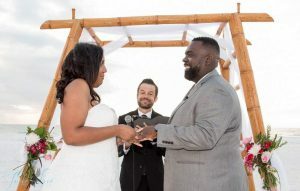 There, the the couple shared their vows which they’d written themselves, exchanged rings, and were pronounced husband and wife by Pastor Rich Tiemann of Sensational Ceremonies. They also incorporated Mikhal’s daughter into the ceremony to commemorate the formation of their new family. Tammy Lackore of A True Love Affair Intimate Florida Weddings did an excellent job capturing the moment with some spectacular photos! Congratulations to the new Mr. and Mrs. Christopher and Mikhal Hubbard!